In 2018, you are never more than a click away from the blowout of your dreams, a masseuse who knows exactly how to work that kink out of your back, a makeup artist who can turn you into a full-blown glam queen, or a professional dermatologist who can troubleshoot your breakouts from the comfort of your couch. The wise people who make technology happen are finally using their powers for good, aka developing apps that make scoring a beauty appointment as easy as smashing a Like. This is why we love beauty on demand apps, but more than that we love the apps that provide amazing features for both the consumers and the beauty service providers! 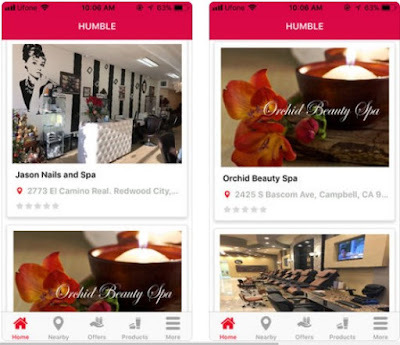 The Humble App is creative and innovative platform that aims to simplify the lives of both, beauty consumers and service providers. This app is an amazing mesh of features that everyone can benefit from. As a customer, one can find the exact service they require from manicures, to hair and make-up styling and everything and anything in-between. Within just a few seconds, customers can find out about the prices, ratings, reviews or portfolios of their chosen beauty artist or salon. They can book appointments or hire a freelance beauty professional with a simple swipe on the screen of their smartphone. The Humble App, aside from all of the features useful for the customers can be an amazing tool for every professional beauty artist, no matter if they are business owners and have a beauty salon or they operate freelance. If you create a business owner or artist account on the app, you will be provided with a profile where you can market all of your services, reach consumers nationwide and build up your brand. The app can be a great place for anyone involved in the beauty industry, as it provides business growing features that may lack from many of the beauty apps available on the market. If you are interested in giving the Humble App a try, you can find and download it for free from the App Store.